Can someone please try to justify these expenses? All I see is an evil man spending money that isn't his to punish people he doesn't like for trying to do stuff on their own property. If maybe we had just made sure he got his cut perhaps we could have built a truck stop on our property. Maybe we could have built a bunch of houses on land locked property like the Johnson's did on Stafford rd? I read Wettlaufer's flyer about how great he is. What about this $70k Jim? How come you didn't write a paragraph on your flyer mentioning how in the town's best interest you spent $70k to punish citizens of Holland with unnecessary lawsuits? It's not like we are major corporations trying to build a truck stop in Holland. The people that you used your super lawyer to punish, Chad, Dad, Me, Peter & also Trenton are people who truly love Holland. It is one of the best kept sanctuaries in central/western Mass. I could not think of a better place to raise my children. That is until we have to deal with the town hall, mainly king Wettlaufer and all his cronies. These receipts Peter provided raise a lot of questions that anyone that voted tomorrow should consider. I say vote the bum out. The receipts that were provided are only the tip of the iceberg. 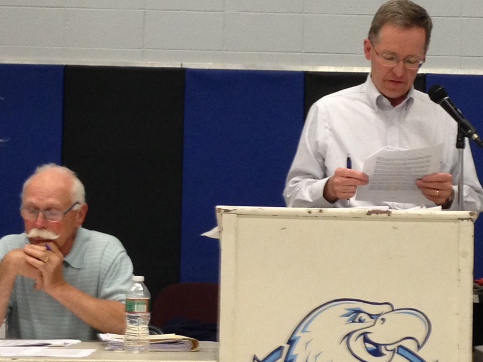 No one really knows how all the money which gets transferred into the Selectman's discretionary funds get spent. There seems to be no accounting and no oversight of those funds. For example, the 15K that voters approved to demolish a house.... (many years ago...at least 10) WHERE DID THE MONEY GO??? Because the house is STILL STANDING!!! 25K was approved to pave our senior center. Now that it is warm enough to pave..... Where is the 25K to pave it?? Why isn't it already done? Posted on 8 Jun 2014, 12:57 by Looking in at the cost. Prior to Sapirstein, Wettlaufer paid Nancy Frankel Pelletier 10 thousand bux to stop LaMountain from burning.. Then he had Vincent McCaughey sue LaMountain in the Housing Court for another 20,000 dollars... Then Wettlaufer spent another 10 thousand after he had Johnson barricade LaMountain's beach. Wettlaufer lost the barricade issue and had to remove it.. After that Vincent McCaughey refused to participate in Wettlaufer's private feud. . Wettlaufer fired McCaughey and hired Sapirstein who, like Wettlaufer, has no ethics. Attorney Pelletier also handled the town's defense on my suit about the ANR plan which the Planning Board (PBH) refused to sign while Earl Johnson served on the PBH. Earl Johnson's famous question to me was, "if you don't want to pay taxes for the rest of your life, why don't you donate the peninsula to the town?" was also not very appealing or realistic as everything else the Johnson's suggest. I was forced to sue the town. The town's insurance paid for the initial suit and the ensuing appeal which was decided in my favor. Even so the insurance paid for the two proceedings, for each proceedings, the town had to pay a retainer of $8,000. Posted on 25 Jun 2015, 13:24 by Frei was right once again. It is good to see wettloffer resigned his final town position in shame after selectmen refused wettloffer a request to pay his tens of thousands in fines for paying Johnson's private legal bills.